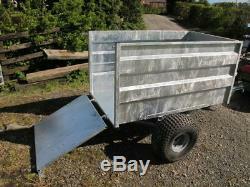 All steel highsided galvanized tipping trailer suitable for use behind ATV's and lawn tractors. Carry your logs, garden waste, rubbish, horse manure etc behind your ATV. Tipping is easy due to the spring assisted tipping mechanism. Clever design enables the trailer to tip easily to a steep angle for easy discharge. Drop down low rear door or can be specified with a ramp tailgate. Body size is 60" long 36" wide and 32 high. Fitted with low ground pressure 22-11x8 tyres on bead lock rims. Swivel hitch as standard for safety. Body is fully seam welded for a long life. We also manufacture a low sided model with 16 sides. Last pictures shows the optional 22-11x8 four ply tyres fitted onto a 8-50x8 rim. 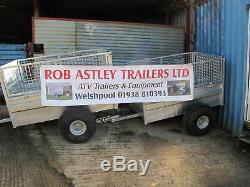 Rob Astley Trailers Ltd Welspool Powys. We deliver by pallet courier or with our own transport. Just making it clear for some those who don't understand! The item "Tipping trailer for use with ATV Quad bike, compact tractor" is in sale since Saturday, August 26, 2017. This item is in the category "Business, Office & Industrial\Agriculture/Farming\Trailers". 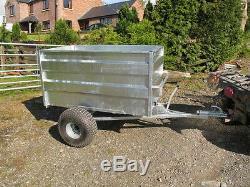 The seller is "robastleytrailersltd" and is located in Welshpool.